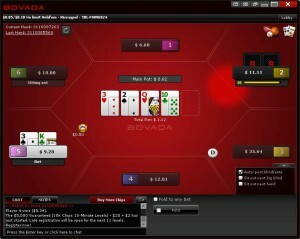 Bovada is one of the few online poker rooms that still services players from the United States. They offer a 100% up to $1,000 deposit bonus, so read on for the details. Bovada offers a 100% up to $1,000 poker bonus and is currently ranked #4 out of 28 reviewed poker rooms with an overall score of 102.60. Visit www.Bovada.lv for more details and to download the official Bovada software. The new player bonus at Bovada is activated automatically – no bonus code is required when signing up or making a deposit. 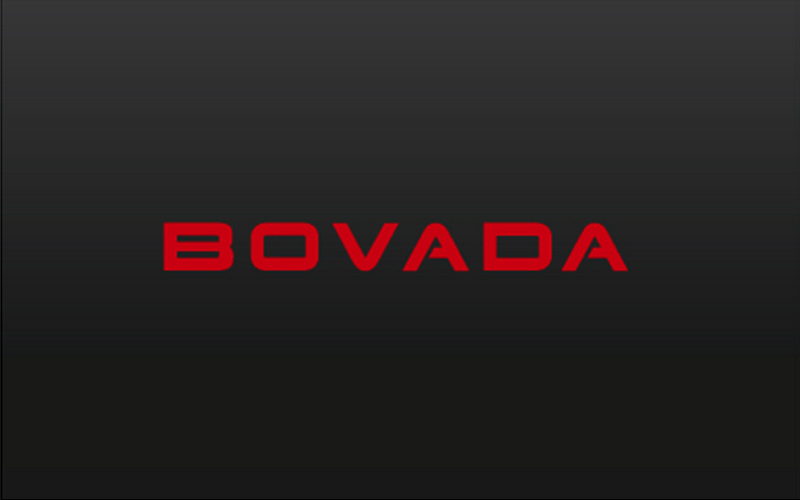 If you haven’t yet setup an account with Bovada, and would like to support Bonus Ace, you can use our links to visit Bovada.lv, create an account, and make a real money deposit to activate your bonus. If you’re deposit from the US with a Visa (which is preferred) you will almost certainly run into an issue with a maximum deposit amount. Your first deposit may be capped at $600. Even if this is the case, you can still qualify for the full $1,000 bonus by making separate deposits. 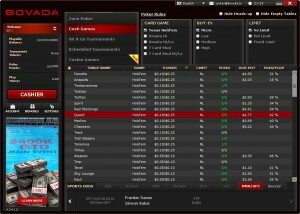 Bovada will combine all deposits made within 24 hours into one amount. You can also email poker@bovada.lv to ensure they combine them. You can also contact email them prior to making your deposit, or call 1-866-950-3500 24 hours per day, to attempt to raise your limit for your first deposit. Once your deposit is cleared and bonus is active, it’s time to clear it. You have a total of 60 days after your deposit to earn poker points to release the bonus. So looking at the table, once a player earns 50 poker points, $10 of the bonus will be released. Once they continue playing and earn 200 more points (250 total), $40 more of the bonus will be released, for $50 total. This continues until the player collects 5,000 points total for the full $1,000. The bonus is top heavy, meaning you earn most of the bonus at the higher levels. The value is consistent throughout the levels, but each level requires more points making it difficult to unlock the full amount. If you’re only able to earn 4,000 points within 60 days then you would only collect $600 of the $1,000 bonus. As you clear the bonus and make it to the next level, the bonus will automatically be released into your account. As mentioned earlier, 3 points are earned for every $1 paid in tournament fees. This means a $50 + $5 tournament would award 15 poker points. They also award 1 point for every $1 in rake paid in cash games. So with a 60 day time limit and a total of $1,667.67 rake required, the rake per day pace is $27.78. If it’s easier looking at points, 5,000 total points are required, or 83.33 points per day for pace. The overall value of Bovada’s poker bonus is really high, but it still requires a high volume to clear the full amount. If you play around the $20 tournament level, you will have to play around 14 tournaments per day. If you’re looking to play now, you can visit Bovada.lv now from any device or platform and start earning your $1,000 deposit bonus! Looking to get started? Signup at Bovada through Bonus Ace by using the link above. New players can receive the 100% up to $1,000 opening bonus offered, described in this review.